Address 30 E Tobey Dr.
Brief History: Established in 1979, the members of H.C.C. began meeting in homes. 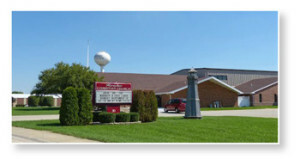 On February 2, 1980 the members began meeting at the Community Center(now Village Hall). On March 16, 1986 land was purchased for the purpose of building a new church building. On March 6, 1987, H.C.C. was granted permission to build a building on that property. Construction on that building began in September of 1987. The building was finally completed on June 26, 1988. H.C.C has continued to worship in that building since it’s completion. The buildings location is directly east of the State Bank of Herscher. Sharing God’s love with all people.